Star Wars: Rogue One. 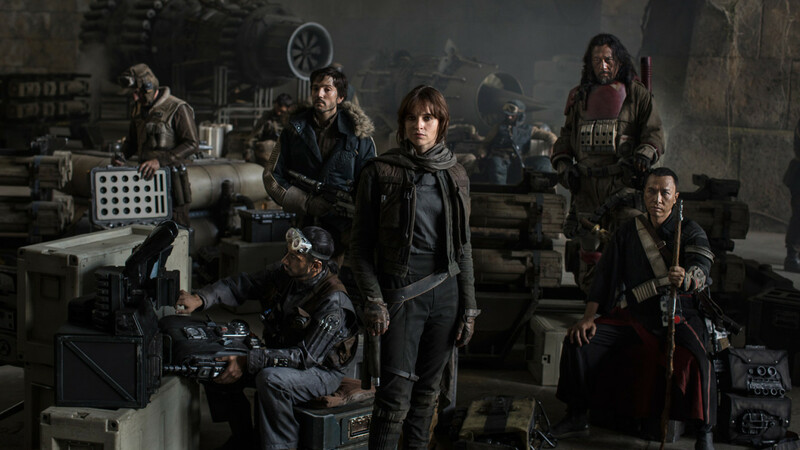 Left to Right: Actors Riz Ahmed, Diego Luna, Felicity Jones, Jiang Wen and Donnie Yen. The filmmakers have assembled a stellar cast, including Felicity Jones, nominated for an Academy Award for her leading role in The Theory of Everything; Diego Luna, who was featured in 2008’s Oscar-winning Milk and the critically acclaimed Killing Them Softly; Ben Mendelsohn, recently nominated for an Emmy for his leading role in Bloodline and co-starring in the upcomingMississippi Grind; Donnie Yen, Hong Kong action star and martial artist who starred in Ip Man and Blade II; Jiang Wen, who co-wrote, produced , directed and starred in the award-winning Let the Bullets Fly and Devils on the Doorstep; Forest Whitaker, recently featured in the critically-acclaimed Lee Daniels’ The Butler and winner of an Academy Award for his leading role in 2006’s The Last King of Scotland; Mads Mikkelsen, who starred in The Hunt and was the memorable villain from 2006’s Casino Royale; Alan Tudyk, who plays a performance-capture character in Rogue One, stars in the soon-to-be-releasedCon Man series and Trumbo, which releases this November; and Riz Ahmed, who was recently featured in Nightcrawler and starred in the BAFTA-winning film Four Lions.